Woodwinked, Sable, Cranberry, Pink Freeze, Shadowy Lady. Mac has endless eyeshadow offerings, from neutrals to cool tone hues to brights and matte blacks. It can get a little overwhelming if you don’t know what you want, or looking for. I have recently added in my last eyeshadow to my pro palette. This is a great way to build up your collection and to keep all of your favourite shades in one place. I have the Large Pro Palette (£14) and the 15 pan eyeshadow insert (£6.50). Never do the maths and add up what the whole palette will cost you, if you do, you may need to sit down afterwards. In the long run it will cost you less than buying the shadows individually and it will also save you a lot of space. This palette will last you years and you can rearrange the shadows as you please. If you don’t want to go for the 15 pan however there is a 4 Pan eyeshadow palette (£6.50), which may make you feel better about buying each shadow; and a little easier on your bank balance. How did I choose colours for my palette? I picked colours that I know I will use. As you can see I have played it safe with neutrals and mattes, however I do have the odd few brights and darker mattes. When It came to choosing the colours, I went for colours that are very versatile. I like to fill in my brows using eyeshadow so I have two matte shades in this palette for my brows; Omega and Charcoal brown. There both great for the brows and as a crease colour. I tend to use Omega the most, for my brows and as a wash of colour all over my lids. After I got my brows sorted I went for colours that I could use as a base for a smokey eye or just as a wash of colour for my lids. Vanilla, Naked Lunch and All That Glitters tick all the boxes for me when it comes to finding a base colour. Vanilla is matte so this is also a great shade for highlighting those brow bones. All That Glitters and Naked Lunch are shimmers and look beauts all over the lids. To complete any smokey eye you need darker shades, so I chose a few matte shades as well as shimmers. Wedge is a perfect matte brown for every look that you want to achieve, Patina is my newest and I haven’t yet used it but it is a frost formula and looks stunning. Tempting was my first ever mac shadow and I remember buying this for my school prom so I could try and recreate the smokey eye the lady did on me. It blends beautifully and looks amazing on it’s own, blended out for a smokey eye. It is however very similar to wood winked. Wood Winked has a veluxe pearl formula and Tempting has a lustre formula but they look very similar in colour. Sable, Cranberry, Pink Freeze and Shadowy Lady are colours that I would class as ‘out of my comfort zone’ shades. However they are all stunning. Sable is a gorgeous shade for bringing colour to a very plain smokey eye. When blended it turns a very stunning rose gold colour. 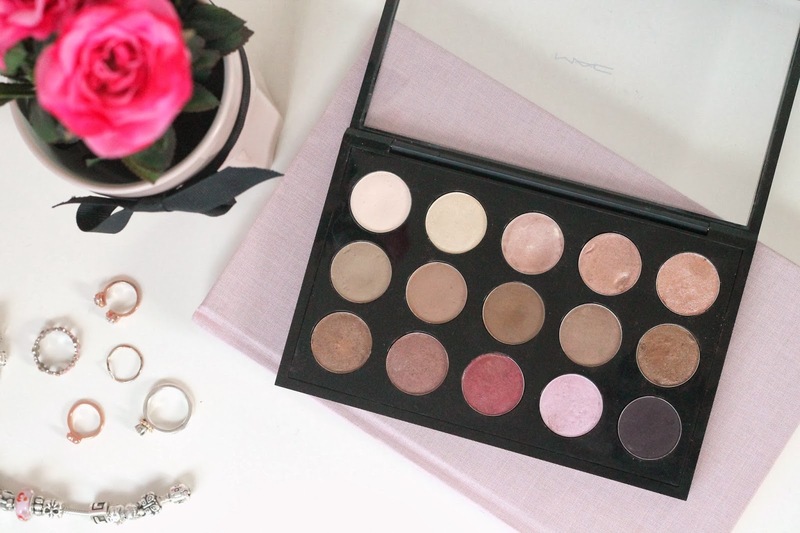 Cranberry is my new favourite and I love paring it with Pink Freeze; for a pink smokey eye. Shadowy Lady is a matte purple, crazy I know. This adds depth to any smokey eye, its a deep blackened plum colour. My two highlighting shades in this palette are Nylon and Pink Freeze, they are both suited to highlight the inner corners of your eye. My Favourites are Vanilla because its matte and a gorgeous brow bone highlight. Nylon for highlighting the inner corners of my eyes. Omega brows and crease. Check. Sable for a quick and easy one colour smokey eye. Cranberry for any pink smokey eye cravings. Do you have your own Mac pro palette? What are your favourite Mac shadows?